This is a Saturday Slalom puzzle. This entry was posted on April 3, 2010 at 4:00 am and is filed under Slalom,  Fri/Sat. You can follow any responses to this entry through the RSS 2.0 feed. You can leave a response, or trackback from your own site. I don’t know what you had in mind here, but I had to use a whole shovelful of meta-logic and reverse-engineering to get this one started and after that it was pretty easy. The trickiest step is definitely early on, so that isn’t terribly surprising to hear. 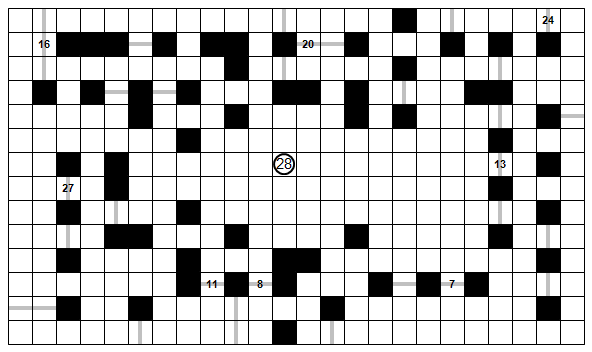 For a hint, try drawing a vertical line down the center of the puzzle. This hint was really handy. Also, though I don’t know why, I had it stuck in my head that the circled “28” at center functioned as a gate, which messed me up a bit, since that would have made 29 gates. Despite my typical boneheadedness, I got there in the end. I wasnt getting anywhere on this one (other than a bunch of initial incomplete steps). These initial steps were forcing certain paths to avoid results that would clearly lack singularity. So, I started drawing in lines along such forced paths, and then the result unfolded with a tweak here or there. I tried to go back with the solution path in find and force the answer through logic and failed (both because I couldnt see it as before, and because once you find the solution on a puzzle, your energy for finding the logic to compel it as a unique solution wanes). I solved the puzzle, but not for the right reasons in my eyes. Feel free to judge me as you must. This one does have a logical solution, so if you ever decide to try again to find it at some point, the hint I gave to Georgi might be useful to you too.